There are three bosses in Launch Base Zone Act 2. The first one normally can only be accessed by either Sonic or Tails (or both). Once that boss is defeated, Sonic and/or Tails is/are brought to another arena when he/they face another boss. In Sonic 3 & Knuckles, the level ends there; In Sonic 3 alone, there is one more boss, with an attack which can even hurt Super Sonic. Knuckles instead never faces the first boss, though he always faces the second and the third, although in a different location. In either case, the game proceeds afterwards to either the credits (Sonic 3) or Mushroom Hill Zone Act 1 (Sonic 3 & Knuckles). 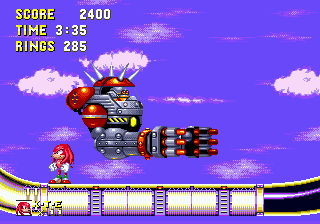 The first boss in Launch Base Zone consists of Eggman elevating himself to a location outside of the player's reach. A door opens on the wall to the right of the player, deploying a large black ball in one of two compartments (top or bottom), intended to harm the player. These can be avoided by jumping over the balls that come out of the bottom compartment and ducking under the raised door when they come out of the top compartment. Alternatively, the player can jump over the balls from the top if already standing on top of the opened door. When playing as Tails alone or airlifting Sonic in collab. mode, it is possible to shimmy along the ceiling of the platform above just before this first boss arena, then flying as high as possible when the screen scrolls over. Doing this will not trigger the invisible wall or Dr Eggman's entrance, so the player can defeat the weird car thing (which just sits there) by jumping on top of it from the right and stay there for another 7 hits. In order to hurt the boss, the player should jump on top of the opened door when the black ball is shot out from the bottom compartment. Once raised, the player can simply jump on top of the opened door; this gives him enough of a boost to further jump high enough to hit Eggman for one of 8 hits. In both Sonic 3 alone and Sonic 3 & Knuckles, Sonic and/or Tails have to fight in order to go any further. Knuckles doesn't have to fight this one because he takes a different route. 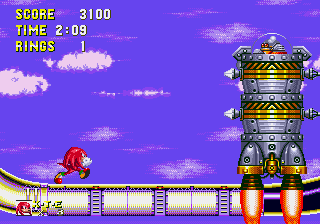 The second boss in Launch Base Zone consists of Eggman in a tall weapon-laden rocket. There are lasers on the side of the rocket which fire lasers both left and right, and there is a small ball of spikes orbiting around the machine's vulnerable spot to prevent the player from simply jumping on top of it over and over again in succession. For every four hits of damage inflicted, the machine will drop a small portion of its essence; when there is only one hit left to do, the machine doesn't have any lasers left, for a total of 9 hits to defeat him. The fight starts with Eggman descending from the right side of the screen. Once descended all the way, he will disappear on the bottom of the screen and appear on the left side, this time moving upwards instead of downwards. This continues until the machine appears back on the right side of the screen as when the fight started. This pattern of movement continues until the boss is defeated. All three characters have to fight against this boss, with the slight issue that Knuckles does it in a different spot in the same level (due to him taking an alternate way on its own). 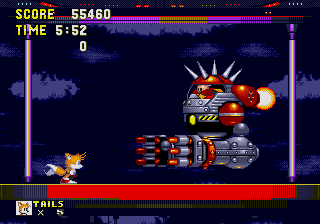 The third boss in Launch Base Zone consists of Eggman in a machine equipped with a claw. Its vulnerable point is the cockpit, but it has spikes at the top so the player can hit it only from the front or from the bottom. It flies back and forth across the screen trying to catch the player in its claw. If it succeeds, the player is thrown at the ground and loses either the current shield, the total amount of rings held or a life. A particularity is that this move can hurt Super Sonic in Sonic 3 alone. In Sonic 3 & Knuckles instead, when this boss catches a Super or Hyper form in its claw, the spring sound effect is played, the player bounces on the ground, and nothing happens. If the boss can't catch the player for several times in a row, it will fly at the top of the screen just to go down right after. It will then try to attack the player by using its spikes at the top of the cockpit. After a while it starts again with the main pattern. It is Sonic and Tails' final boss of Sonic 3 alone, but when the game is locked on Sonic & Knuckles, they don't have to fight against this one. Instead, Knuckles is the only one that has to deal with it, and in a different place of the act. This boss makes its grand return in the portable version of Sonic Generations. ...followed by the Big Arm immediately afterwards. If Knuckles somehow manages to arrive into Sonic's boss arena for the Ball Shooter boss (debug mode isn't even required), he'll fight against Eggman and not against Egg Robo, probably because of the running Eggman animation which takes place before the actual boss fight. However, Knuckles has no way to jump high enough to hit Eggman, so it's not a wise idea to go there. The only way this boss can be beaten as (normal) Knuckles is to stand on the lifting hatch and get hit by a black ball as it launches out of the upper wall; if done correctly, this knocks Knuckles onto Eggman's ledge, where he can be trivially hit 8 times. It is also possible to climb the wall as Super/Hyper Knuckles then stand underneath Eggman, touching him until he is defeated. Both Knuckles and Blue Knuckles can get into this boss arena. Neither of them can hit Eggman under normal circumstances.